Brilliant blue skies and beaming kids were the order of the day Saturday at Dollar Mountain and Carol’s Dollar Mountain Lodge during the 33rd annual Hobson Memorial, a season-ending celebration for the Sun Valley Ski Education Foundation alpine ski-teamers and their proud parents. 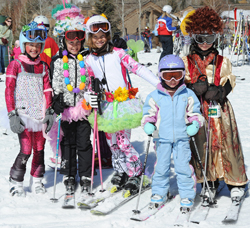 SVSEF Development Team racers posing here on their skis and in their costumes are, from left, Alli Rathfon, Sarah Galles, Katherine Estep, Camas Filbert and Lucca Vernoy. Why is gas so expensive here? Hailey, how do you want to grow?